The Ekiti governorship candidate of the All Progressives Congress (APC), Dr. Kayode Fayemi, appears to have taken a stricter measure to protect himself during his campaigns ahead of the July 14 gubernatorial election in the state. .. 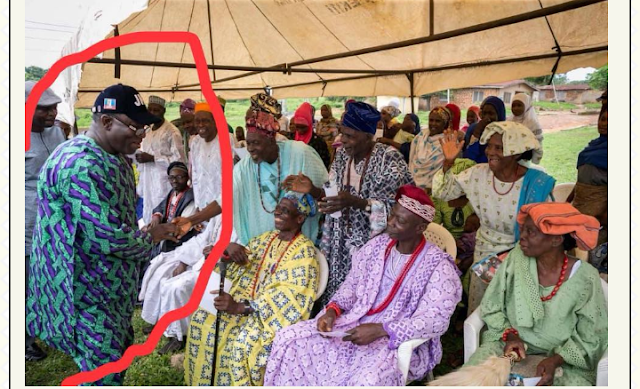 The former minister of Solid Minerals Development, wore a bulletproof vest under his Buba to campaign recently in Ekiti, according to multiple reports. This is coming after a policemen 'accidentally' shot during an APC rally early this month with Fayemi and other dignitaries present. The bullet hit Hon. Michael Opeyemi Bamidele (MOB) before he was rushed to the hospital for treatment. He said he will provide visionary leadership through his Eight-point Agenda to redirect the state to the path of growth and development after four years of rudderless leadership of the People's Democratic Party (PDP). Fayemi also warned Governor Ayodele Fayose against illegal collection of workers' voter cards through coercion, saying the voters have inalienable right to vote for candidate of their choice.